Lawn mowing, although often overlooked, greatly effects your lawns appearance and general health. According to Briggs & Stratton, nearly 70% of Americans say they are willing to do more to help the environment, but not knowing what to do is among the top obstacles to their taking action, according to a recent survey conducted by Briggs & Stratton Corporation, the world's largest maker of gasoline-powered engines for outdoor power equipment. In response to this survey, Briggs & Stratton developed a lawn mower tune-up campaign. They determined that a gasoline powered lawn mower can reduce its emissions by as much as 50 percent over an untuned engine. Not only that, but it can also save fuel and prolong the life of the mower-- all with a simple lawn mower tune-up each spring. Mow header strips at the ends of the lawn and around flower beds first. Make them wide enough that you can turn the mower around in the already mown section. Then mow back and forth between these header strips overlapping each lap by about 1/8 the width of the mower's deck. NEVER SCALP YOUR LAWN. Scalping severely damages the root system to such a degree that it may die. When mowing remove only 1/3 with each cutting (except for the first mowing of the season when it's ok to remove more). You can safely leave clippings that will quickly decompose and add nutrients back into the soil. Contrary to popular opinion, grass clippings do not add to thatch buildup. Grass blades are made up of about 75% water. Keep your mower's blade sharp, which means having it sharpened several times during the mowing season. Keep several blades around so you'll always have a sharp one on hand. Sharp blades cut the grass cleanly and help mulch clippings into small pieces which break down quickly. Don't forget to change your mower's oil at least once during the mowing season. For brand new mowers, change the oil after about 5 hours of operation during the initial break-in period. Leaf blade A demonstrates what a leaf blade should look like after mowing with a sharp blade. Leaf blade B demonstrates a leaf blade that was injured by a dull mower blade. 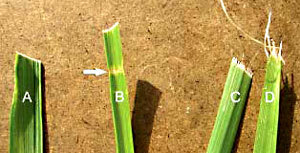 Leaf blade C was cut by the mower but indicates that the mower blade is not sharp enough. The shredded white tissue protruding from the leaf blades C and D is the vascular tissue of the plant. Leaf blade D has been mown for quite some time with a dull mower blade. Grass clippings do not contribute to thatch buildup or increase the chances of disease. If you mow your lawn at the right height, without removing any more than 1/3 of it's total height, clippings will quickly breakdown without a trace. These clippings contribute additional nitrogen and other nutrients to the soil and supply it with additional organic materials. Clippings from a 1000 sq. ft. lawn can add as much as 1 - 2 pounds of nitrogen back into the soil. If you have a compost pile, then you may want to bag your clippings occasionally to add much needed green-matter to the compost pile. Make sure it is mixed thoroughly with brown matter to avoid a strong ammonia odor. DO NOT COMPOST CLIPPINGS after applying any weed control or weed-feed type product. Before adding clippings to the compost pile wait at least 3 mowings after these products have been applied. Read more about buying a new mower. Spending an hour behind a roaring lawn mower can spew nearly the same amount of pollution as a 100-mile car trip, according to a Swedish study. Source: Environmental Science and Technology, the journal of the American Chemical Society. A sharp blade cuts cleanly and guess what? You use less fuel! So keep on checking those blades for sharpness and nicks.